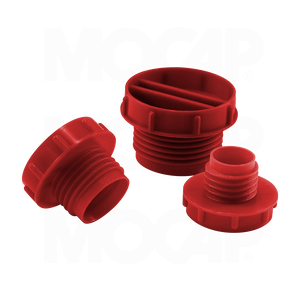 MOCAP General Purpose Plugs are designed for use on Metric threads and fittings. These Threaded Plastic Plugs are knurled for ease with manual assembly, but can also be tightened with a screwdriver or hex wrench. The plugs protect threaded components from moisture, dust and damage during production, shipping and storage, and can also be used as masking during painting and plating. Designed to work in low-pressure testing requirements. Our GPM Series Threaded Plugs are molded in Red polypropylene plastic and sized to plug Metric threads from M12x1.5 thru M22x1.5. MOCAP stocks General Purpose Plugs for Metric Threads in many sizes for immediate shipment.